by Gloria Loring and Dr. Timothy J. Gray, D.O. We've all heard it, over and over, that diet and exercise is what we should be regulating so that we can help reduce our risk of any number of health issues. It's that simple. It's not a cure-all but it goes a long way to treating our bodies they way they were meant to be treated. Monitoring what you put into your body, in the form of food, can only be good for us. 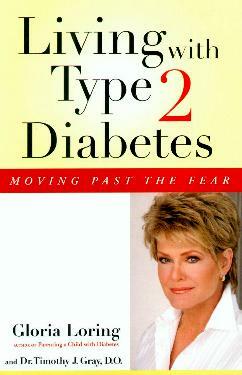 Author and mother of a son with Type 1 Diabetes, Gloria Loring has teamed up with Dr. Timothy Gray to write this easy-to-navigate book. According to their book, "One out of every three people born in the year 2000 will develop diabetes". To me that is alarming news. I liked their clear-cut explanation of diabetes on page 23 - makes it much more understandable. And, aha: "Because insulin is a hormone, it cannot be taken orally, because stomach enzymes break it down," says Ms. Loring. Something I never knew. Having diabetes is not a death sentence and huge strides have been made in the treatment thereof. It's important to monitor your medication to find what works best for you. In some instances, people lose weight too. So much is covered in this book, from different kinds of insulin, dosages, storage, administering insulin, diet, medical advice, and so on. All very interesting and informative, giving you a heads-up on what to look for when you're not feeling right, or when someone you know isn't feeling well and perhaps shows symptoms of possibly having diabetes. Ms. Loring seems to have covered all aspects (I don't have diabetes and therefore didn't know if anything was left out) of eating well and treating and coping with Type 2 Diabetes. Being aware of what to look for in our health will go a long way to avoiding, or at least reducing, our health risks. I feel great I spent so much time again this year making a vegetable garden. There's nothing like eating what you grow. Now, if only I could find my own "Expect a Miracle" card for a project I am working on! Visit Ms. Loring's website at: www.glorialoring.com. Conclusion - Infinitely interesting and valuable knowledge (or awareness) of diabetes which you'll get in abundance. This will go a long way to either helping you or someone you know with diabetes.